Jumping behind the wheel in Argentina can sometimes be a dangerous experience. Because the country is striped with narrow two-lane roads, cars often pull into oncoming traffic hoping to overtake slower-moving trucks. This risky maneuver contributes to a shocking statistic: In Argentina, traffic accidents kill one person every hour. Faced with this alarming reality, Samsung and its agency Leo Burnett Argentina set out on a bold mission to curtail the number of traffic-related deaths caused on those dangerous roads. 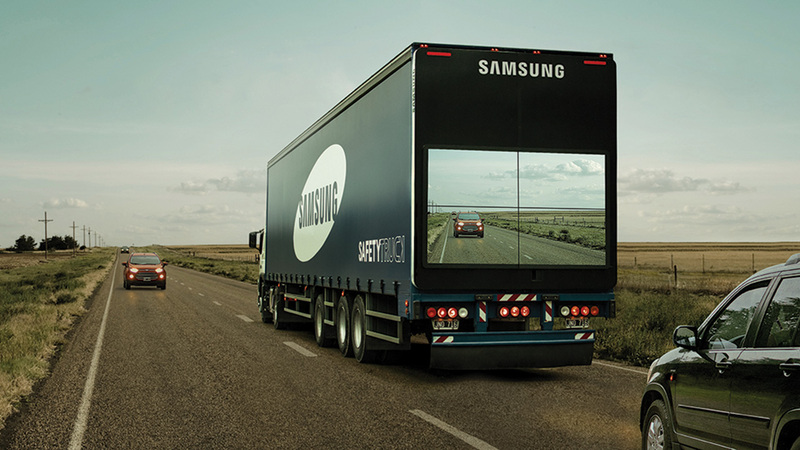 Fusing Samsung's technology with Leo Burnett's creative prowess, the duo landed on Samsung trucks as the perfect vehicle, so to speak, for a campaign that had the potential to save lives as it showcased cutting-edge technology. The resulting idea, heralded at the Cannes Lions as one of the world's top creative efforts, has now also received the Gravity Award, the top honor in Adweek's Project Isaac Awards honoring creative invention. The agency's initial concept revolved around transforming the byways themselves. The idea was simple: Turn two-lane roads into four-lane highways where overtaking is significantly safer. But clearly, an undertaking of that size was a bit more than the agency and client could afford. So Fernando Bellotti, president and regional chief creative officer of Leo Burnett Argentina, and his team shifted gears to make the roads safer for drivers in Argentina and—hopefully one day—the rest of the world. "Instead of focusing on solving the problem from an infrastructure point of view, we tried to focus on the [Samsung] trucks," says Bellotti. "We used technology that was already there in a very innovative way. This idea not only changes people's lives, it saves them." With support from Leo Burnett Chicago and a green light from worldwide chief creative officer Mark Tutssel, the Argentina shop arranged to install a wireless camera on the fronts of the brand's trucks and mount four Samsung outdoor monitors on the back. Now, when stuck behind a truck on a two-laner, the driver would have a clear view of traffic approaching from the opposite direction, making a driver's decision to overtake another vehicle smoother and safer. "This idea embodies everything we value about communication—it's hugely ambitious, brilliantly crafted, compels people to participate through content that captivates people's imagination, and ultimately transforms human behavior. It's visionary work," explains Tutssel, who also serves as global creative head for the Samsung business. Finding a partner that could develop the technology ended up being one of the biggest challenges the team faced when working to bring the idea to life. "We needed people who had software experience and technology experience, as well as people who would help us with the truck," notes Carmelo Maselli, creative director for Leo Burnett Argentina. The creative team dove into the project in late 2014 and took until the following March to develop the technology and ensure it would work when fitted onto the trucks. As soon as the effort hit the roads, it garnered waves of media attention. The video above showing the tech in action has racked up nearly 2 million YouTube views to date. It also scored high praise at Cannes this year. Leo Burnett Argentina left the French Riviera with seven Lions and scored Argentina its first Cyber Lion win. And while awards are always appreciated and much sought after, Maselli believes the campaign transcends any award it could ever receive, seeing as the client, and the country of Argentina, accepted it before it received any industry recognition. "It became part of the culture before we were given any awards, and that is the most important thing," says Maselli. Other companies have taken notice of the groundbreaking work. Brands including Volvo and Helvetica (an Argentina-based trailer company) have reached out to partner with the agency and continue developing the idea. "In the end, the most important things that can happen is to see this idea materialize in many countries, in many different places. That's our end goal," adds Maselli. After all, Argentina is far from the only country with an abundance of two-lane country roads. "We must never lose sight of the most powerful thing: what matters to people," says Tutssel. "That's why everything we do for brands is designed with a human purpose in mind. A brand without purpose is one that will never be understood or embraced by people."